Chocolate Peanut Butter: 3 frozen bananas (sliced before freezing), 2 tablespoons natural peanut butter, and 2 tablespoons cocoa. Blend in a food processor or quality blender until smooth. If the mixture is too thick or you have difficulty blending, then add a few tablespoons of cashew milk or water. Strawberry Poppyseed: 3 frozen bananas (sliced before freezing), 5-6 frozen strawberries, and 1/2 teaspoon poppy seeds. Blend in a food processor or quality blender until smooth. If the mixture is too thick or you have difficulty blending, then add a few tablespoons of cashew milk or water (or fresh fruit juice). Vanilla Coconut: 3 frozen bananas (sliced before freezing), 2 big handfuls of unsweetened coconut flakes, and 1/2 teaspoon vanilla extract. Blend in a food processor or quality blender until smooth. If the mixture is too thick or you have difficulty blending, then add a few tablespoons of cashew milk or coconut water. Mango: 3 frozen bananas (sliced before freezing) and 2 frozen mangos (peeled and cubed). If the mixture is too thick or you have difficulty blending, then add a few tablespoons of cashew milk or water (or fresh fruit juice). This one has a sorbet feel to it! To make the quick-pickled vegetables, first peel the carrots and then use a julienne peeler or regular vegetable peeler to slice the carrot into ribbons. Use a mandoline or a sharp chefs knife to carefully slice the onion into very thin rounds. Stuff the carrots into one pint-sized mason jar and the onions into another (if you mix the two, you’ll muddy the colors). In a medium-sized saucepan, combine the vinegar, water, sweetener, salt and optional red pepper flakes (for spicy pickles). Bring the mixture to a gentle boil, then pour half of the mixture into each mason jar. Use a spoon to gently press the onions and carrots into the liquid, then let the pickles cool to room temperature. Assuming that you sliced the onions and carrots very thin, they should be ready to eat within thirty minutes or less. 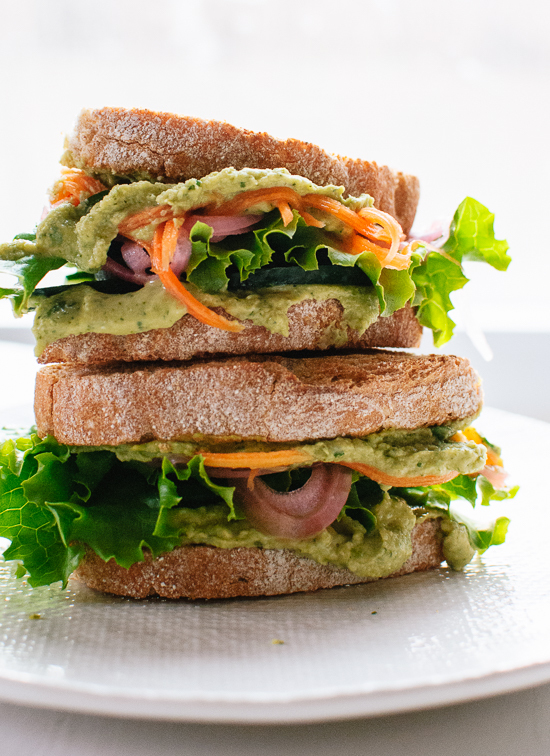 To assemble your sandwiches, spread a hearty layer of hummus onto each slice of toasted bread. Top one slice with a layer of cucumbers, followed by lettuce and some pickles. Place the second slice of bread hummus-side down on top of the pickles. Enjoy! For as much soup and chili as I eat, I have no idea why I don’t have more chili recipes on the blog! This had to change. Enter: Sweet potatoes and black beans married together in a hearty, savory-sweet chili. The ingredients are things you likely have on hand right now. Simple, 5-ingredient sweet potato black bean chili that comes together in less than 1 hour! Easy, delicious, super healthy and so satisfying! Throw in whatever spices you have to amp up the flavor. Add sweet potato and any desired spices at this time (I went for chili, cinnamon, cumin, and chipotle powder – all are optional). Cook for 3 minutes. Then add salsa, water, and vegetable stock. Bring mixture to a low boil on medium high heat and then lower heat to medium-low and simmer. Add black beans, cover and cook for at least 20 minutes more, preferably 30 – or until the sweet potatoes are fork tender and the soup and thickened. This soup is at its best when prepared the night before or allowed to rest for a few hours so the flavor marries with the vegetables and beans. Serve with fresh cilantro, onion, avocado, and/or lime juice. Chips make an excellent spoon.